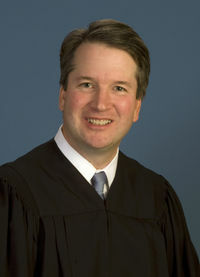 Brett Kavanaugh (February 12, 1965 in Washington, D.C.) is a justice on the U.S. Supreme Court, having been nominated by President Donald Trump and confirmed by the U.S. Senate in 2018, replacing Justice Anthony Kennedy. He formerly served as a judge on the U.S. Court of Appeals for the D.C. Circuit. Kavanaugh is thought to be pro-life and dissented from a decision that required the Trump Administration to be complicit in granting a right to an abortion by an illegal alien 17-year-old girl. Kavanaugh is conservative and supported by Ann Coulter and many others for the U.S. Supreme Court. He is opposed to illegal immigration, and has written several opinions supporting an America First philosophy. He is also a strong opponent of the administrative state, and he has made conservative rulings on social issues such as Second Amendment rights. Some conservatives believe that he relies too much on faulty court precedents and have criticized a ruling that was too supportive of Obamacare. The Never Trump movement is more divided. Some Never-Tumpers, such as David French, assert that a Justice Kavanaugh would have a judicial philosophy closer to that of Roberts or Kennedy than Alito or Scalia. Others, such as Peter Wehner and Ben Sasse, have praised Kavanaugh, although his appointment is unlikely to prompt them to start supporting President Trump. Democrats and the Left, on the other hand, had a completely hysterical reaction to his nomination because he is not a judicial activist. Much of the criticism of Kavanaugh is bizarre. For example, some claim that because Kavanaugh married a woman who once worked as a secretary to President George W. Bush, Kavanaugh is therefore somehow part of the Bush network. Another criticism, coming primarily from dark money types, relates to Kavanaugh's ruling that upheld the constitutionality of limits on contributions to political parties in Republican Nat'l Comm. v. FEC, 698 F. Supp. 2d 150 (D.D.C. 2010). In 1991, Kavanaugh clerked for Third Circuit Judge Walter Stapleton in the same year in which Stapled authored the majority opinion (joined mostly by future Justice Sam Alito) in Planned Parenthood v. Casey, before that case was reviewed and decided by the U.S. Supreme Court in 1992. Kavanaugh reportedly strongly opposed the publication of salacious details in the Starr Report while Kavanaugh was working for Ken Starr on the Lewinsky matter, but Ken Starr overruled him and published it anyway. Kavanaugh has had an exceptional record of his opinions being embraced by the U.S. Supreme Court on appeal, whereby the Supreme Court has adopted Kavanaugh's views 13 times and reversed him only once. In 2017, Kavanaugh gave a speech praising the former Chief Justice William Rehnquist for his opinions on several controversial issues, including prayer and abortion. Conservatives have criticized Judge Kavanaugh for conceding that the government has a "compelling interest" in promoting contraception. Defendants of Judge Kavanaugh has said he was merely following the Supreme Court's decision in Burwell v. Hobby Lobby Stores, Inc. (2014), as lower courts are bound to do. But Judge Kavanaugh actually went further in the direction of Planned Parenthood than the Supreme Court had. In his dissent in a related case, Priests for Life v. HHS, Judge Kavanaugh first says that it is necessary to decide whether or not the government has a compelling interest in promoting contraception, because that is a step in applying RFRA to the plaintiff's claim to be exempt from Obamacare's contraceptive mandate. Then Judge Kavanaugh discusses at length the issue of compelling interest. Judge Kavanaugh concedes that the Supreme Court "did not formally hold" that the government has a compelling interest in promoting contraception. He should have stopped there, but he didn't. Instead, Judge Kavanaugh took an ambiguous statement from a concurring opinion by his old boss Justice Kennedy, combined it with the opinion of the four dissenting Justices, and concluded that "a majority of the Justices in Hobby Lobby (Justice Kennedy plus the four dissenters) would suggest that the Government has a compelling interest in facilitating women’s access to contraception." Judge Kavanaugh then wrote a long paragraph full of Planned Parenthood propaganda, containing many factual assertions about the alleged "numerous benefits" of contraception, benefits which he claimed are "commonly accepted" even though they are all disputed and rebuttable, and not supported by evidence in the record (not that any of the assertions should be subject to judicial fact finding anyway). In Hobby Lobby the Supreme Court assumed without deciding that contraception is a compelling interest, and Judge Kavanaugh should have done likewise. Instead, he appears to have gone out of his way to hold that the federal government has a legitimate interest, even a compelling interest, to promote contraception or facilitate access to contraception. In fact, the Supreme Court has never found or held that there is any public purpose or social benefit, let alone a compelling interest, to justify federal legislation promoting contraception. Without such a finding, the entire contraceptive mandate should have been thrown out, not just for religious objectors. The federal government began funding contraception after the passage of Title X in 1970, but apparently no one has ever challenged the constitutionality of Title X as to whether it served a legitimate public purpose. Contrast that to New Deal passage of Social Security and Unemployment Compensation programs, which were upheld by the Supreme Court in 1938 based on a finding that those programs were justified because they "provide for the ... general welfare of the United States" as provided in Article I, Section 8 of the Constitution. It may be true, as Judge Kavanaugh says, that the alleged "numerous benefits" of contraception are "commonly accepted" as a result of 50 years of Planned Parenthood's federally funded propaganda, but that does not mean they have been found to be true. A valid public purpose is needed to compel private conduct, and no valid public purpose or social benefit has ever been recognized by the Supreme Court. On another note, although Kavanaugh's argumentation was in a dissent that has no legal weight whatsoever, it is still troubling because it was rooted in the idea that assumptions for the sake of scenario creation are identical to arguments intended to have a reasonable person interpret them as being implicit adjudication. This idea has the potential to cause damage on two fronts. First, it paves the way for incorrect interpretations of Hobby Lobby by future lawyers and judges. And second, it opens a pathway to abuse of discretion by future judges due to conflation of terms. In December 2018, Kavanaugh (along with John Roberts) sided with the liberal wing of the Court, in a 6–3 vote to decline to hear three cases relating to Republican efforts to defund Planned Parenthood at the state level. Kavanaugh's decision (and those of the other five justices in the majority) were implicitly criticized in a dissent written by Clarence Thomas, which stated that "the Court's refusal to do its job" may have had "something to do with the fact that some respondents in these cases are named 'Planned Parenthood.'" ↑ Binder, John (July 4, 2018). ‘America First’ SCOTUS Choice: Judge Brett Kavanaugh Applies Trump’s Economic Patriotism to the Law. Breitbart News. Retrieved July 5, 2018. ↑ Merriam, Jesse (July 6, 2018). Kavanaugh the Right Pick for Trump. RealClearPolitics. Retrieved July 7, 2018. ↑ Binder, John (July 10, 2018). Experts Praise Kavanaugh: Will Safeguard American Workers and Sovereignty. Breitbart News. Retrieved July 10, 2018. ↑ Gershman, Jacob (July 9, 2018). Brett Kavanaugh Has Shown Deep Skepticism of Regulatory State. The Wall Street Journal. Retrieved July 10, 2018. ↑ Bravin, Jess; Kendall, Brent (August 31, 2018). Brett Kavanaugh’s Record Shows Push to Restrain the Regulatory State. The Wall Street Journal. Retrieved August 31, 2018. ↑ Hurley, Lawrence (July 9, 2018). Washington insider Kavanaugh boasts conservative credentials. Reuters. Retrieved July 11, 2018. ↑ Hawkins, Awr (July 9, 2018). Brett Kavanaugh: ‘Semiautomatic Rifles Are Constitutionally Protected’. Breitbart News. Retrieved July 11, 2018. ↑ Schallhorn, Kaitlyn (October 6, 2018). Kavanaugh's staunch gun-rights defense among hundreds of decisions in spotlight. Fox News. Retrieved October 6, 2018. ↑ Kunzelman, Michael; Neumeister, Larry (July 28, 2018). Analysis: No mystery to Supreme Court nominee Kavanaugh's gun views. Chicago Tribune (from the Associated Press). Retrieved October 10, 2018. ↑ Adelmann, Bob (July 10, 2018). Trump Supreme Court Nominee Brett Kavanaugh Relies Heavily on Judicial Precedents. The New American. Retrieved July 10, 2018. ↑ Wolverton, Joe (July 14, 2018). Trump SCOTUS Nominee Kavanaugh Has Big Government Biases. The New American. Retrieved July 14, 2018. ↑ Brett Kavanaugh Is an Excellent Judge, but Is He the Best Choice? ↑ Kirkwood, R. Cort (July 10, 2018). Democrats Hysterical Over Kavanaugh. The New American. Retrieved July 10, 2018. ↑ SUPREME COURT: IS BRET KAVANAUGH PART OF A BUSH-TRUMP DEAL? ↑ p. 15-19 of the opinion, pp. 42-46 of the pdf. ↑ Klukowski, Ken (December 10, 2018). Brett Kavanaugh and John Roberts Reject Two Cases Involving Planned Parenthood. Breitbart News. Retrieved December 10, 2018. This page was last modified on 9 April 2019, at 00:46.